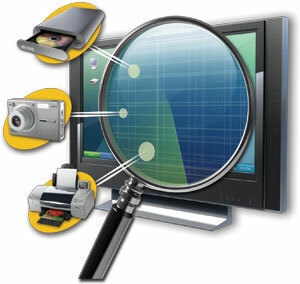 When you connect a new accessory to your computer, such as a mouse, a keyboard, or a camera, that device is foreign to your computer. This is true even for non-external accessories such as graphics cards. When you connect these new devices, without a driver, your computer has absolutely no idea what to do with them. As far as your computer knows, the new graphics card you just installed is just a jumbled pile of electronic equipment. This is why drivers are necessary. So, what is a driver? What happens when you’re typing a document on your computer and you press a key? When you press the “W” key on your keyboard, the keyboard driver is able to interpret that as an input of the letter “W.” The driver then communicates with your word processor telling it to type the letter “W” in your document. It works in the opposite direction too. Consider what happens when you play a video game: the video game software sends commands to the graphics/display driver telling it what to display on the screen; the driver then communicates these commands to your computer screen, thus displaying the video game. Drivers are essentially translators that translate the commands of software into the language of hardware and vice-versa. When you buy a new computer, it already has many drivers installed on it. These drivers allow the operating system to communicate with the hardware. Without these pre-installed drivers, your computer would be unable to receive input from the keyboard or mouse. Usually, when you buy new equipment for your computer, it comes with either an installation CD (this is becoming somewhat rare) or will be set up to automatically download a driver from the internet. Drivers are device specific. If you buy a new model of keyboard, you will have to install the driver that was made specifically for that keyboard, even if you already have a driver on your computer for your old keyboard. Drivers are an essential part of your computer’s functionality. Without drivers, you wouldn’t be able to type or use a mouse. Without drivers, you wouldn’t even be able to see anything on your computer screen. Drivers act as a liaison between your operating system or software and the physical computer itself. Computer programmers know that when they want their program to make use of external hardware, they have to use driver specific commands. So next time your computer notifies you of a driver update or installation, know that it’s very important.